I am loving Heidi and Lori’s contribution to the Gingerscraps Buffet this month. Available EXCLUSIVELY at Gingerscraps this month. 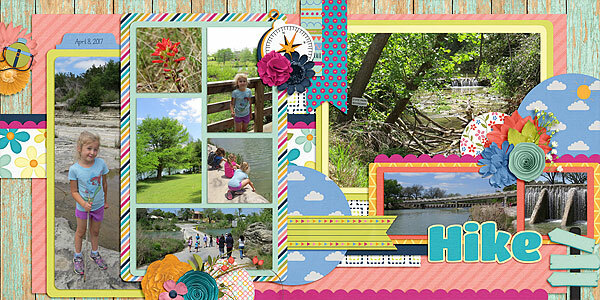 Bring the fun of summertime to your scrapbooking pages with Wildflowers & Sunshine. This sunny, whimsical kit injects pops of warmth and fun to your page with a color palette drawn from wildflowers, sunny days, and the rich summer sky twinkling with stars. Don’t let the title fool you though – there’s more to this kit than just flowers! Featured elements include a tent, a camper, a backward, a campfire (complete with marshmallows), a canteen, a lantern, moon and stars, a canoe, a compass, a flashlight, and an owl. There’s plenty of flowers, sunshine, and greenery too. There’s even a cute doodled alpha and a collection of bottle cap word art to round out your layouts. So spend your days soaking up the summer sun and your nights scrapping those stories with Wildflowers & Sunshine. This kit is Scraps N Pieces’ August 2018 Buffet kit. You can buy the cardstocks, papers, elements, and alpha separately or in the combined kit. Template Pack 41 sold separately. And here’s brand new Template Pack 41. These templates were all inspired by ME and the layouts I created. I have three layouts to share today. The first one uses one of the templates. 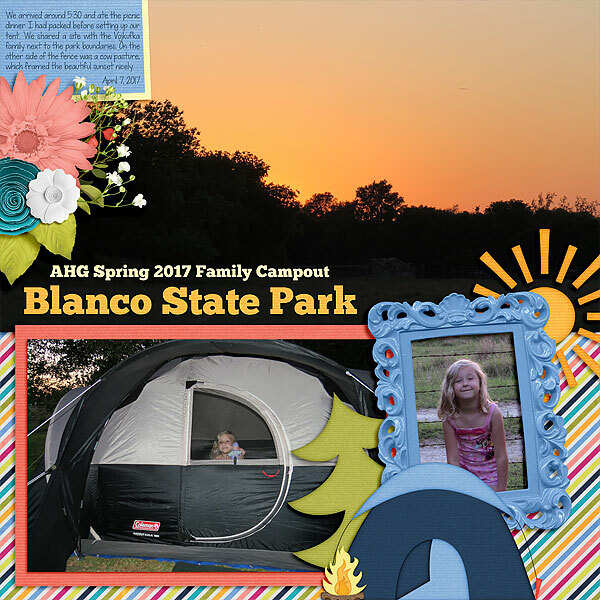 They all document our American Heritage Girls Troop 1516 Spring 2017 family campout. These next two document the hike we took. I still need to finish the layout about the cliff swallows we saw on the hike. If your heart belongs to “the city that never sleeps,” you absolutely need to get New York, New York. 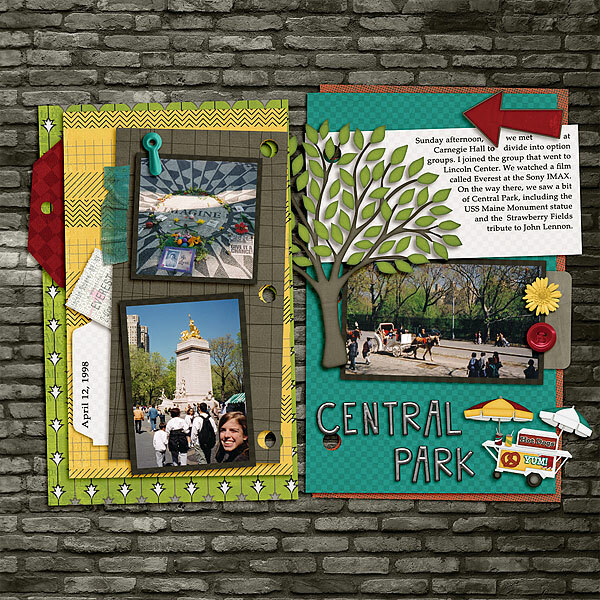 This kit perfectly captures the essence of New York City: bold and busy patterns that are always in motion, slightly gritty solid papers, and a shiny chrome alpha. But it’s the elements that really bring it home: Broadway, Wall Street, pizza, hot dogs, taxi cabs, the Statue of Liberty, FDNY memorabilia… It’s enough to make you put the “I <3 NY” badge on every page. Included is a pack of ‘fun fact’ tags for some of the most famous landmarks, making it easy to tell the history and still save space for telling your stories. As always, there are plenty of more traditional buttons, banners, flowers, and fasteners for mixing and matching with other kits if you don’t have a Big Apple trip on the horizon. 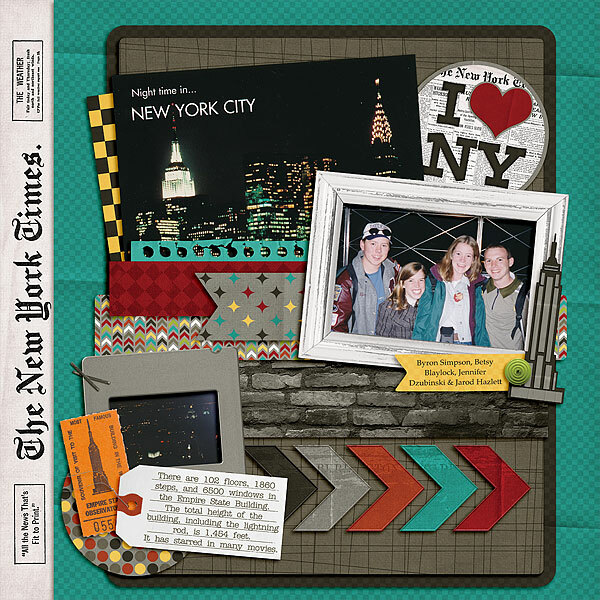 If New York City stories are filling your to-scrap folder, make a night of it and jazz them up right with New York, New York. Kit is 50% off at Gingerscraps and My Memories this week. I had the perfect photos to scrap with this kit. It’s hard to believe that this trip was 20 years ago. It was so fun. This was back when I purchased quite a few postcards when I traveled. Now with digital photography, I don’t purchase post cards as much, unless I actually mail them. Sail Away is the perfect kit for all your cruising adventures. Its color palette brings to mind the open sea, blue skies, turquoise waters, white sand beaches, and the bright sunny days spent on vacation. Much like a cruise ship, there’s plenty to see, including bold patterned papers, luxurious solids, sandy textured papers, and watercolor papers too. But it’s the elements that add the adventure in this kit. There are deck chairs, sandcastles, bikinis and flip flops for those days in port; snorkelers, dolphins, and whales for excursions; word strips for popular ports of call, a glossy blue alpha and, of course, several different cruise ships. So if your heart is still in international waters, scrap those spectacular cruise views with Sail Away. For the Buffet this month we have two paper packs, embellishments, alpha, word bits and a new template pack. Or you can buy the bundle that includes everything except for the templates which are sold separately. These packs are available exclusively at Gingerscraps this month and will be in My Memories next month. All products are on sale this week. 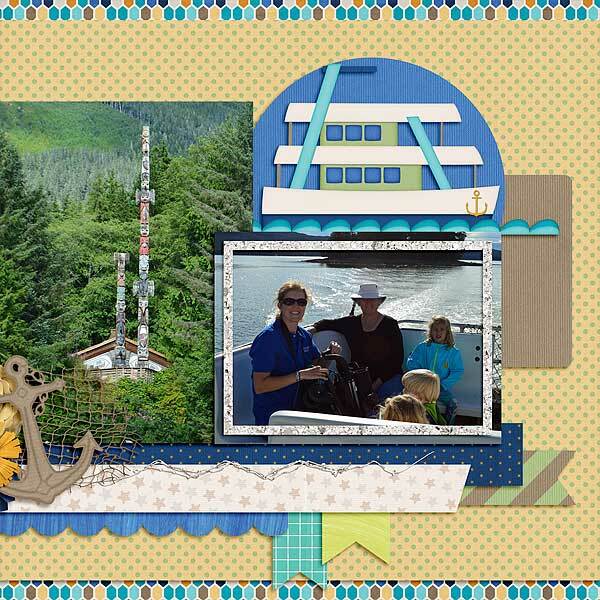 I have some layouts that document Ketchikan. First up is a double layout. 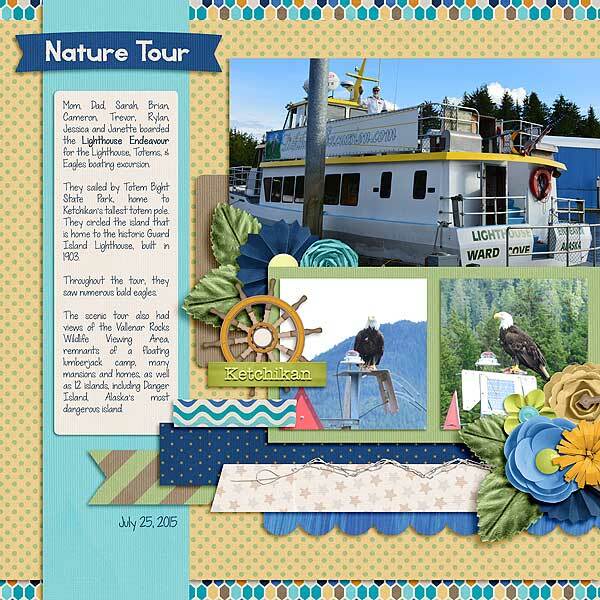 Journaling reads: Mom, Dad, Sarah, Brian, Cameron, Trevor, Rylan, Jessica and Janette boarded the Lighthouse Endeavour for the Lighthouse, Totems, & Eagles boating excursion. 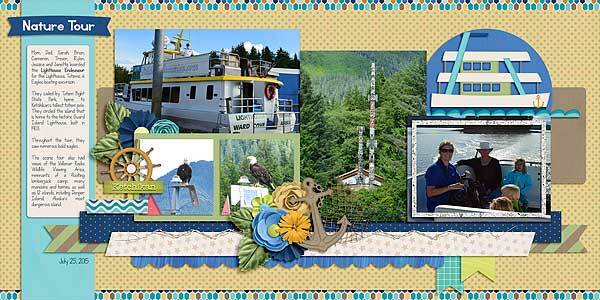 They sailed by Totem Bight State Park, home to Ketchikan’s tallest totem pole. 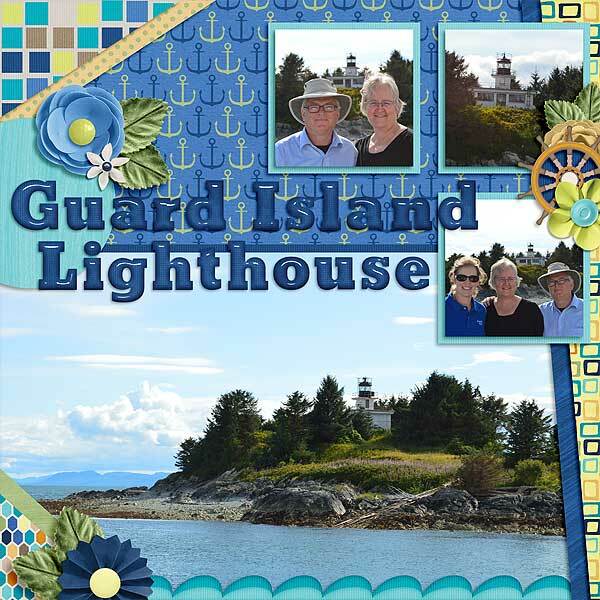 They circled the island that is home to the historic Guard Island Lighthouse, built in 1903. Throughout the tour, they saw numerous bald eagles. The scenic tour also had views of the Vallenar Rocks Wildlife Viewing Area, remnants of a floating lumberjack camp, many mansions and homes, as well as 12 islands, including Danger Island, Alaska’s most dangerous island. And here’s a close-up of the left and right sides. And I have one more layout of this particular excursion. Life can be slow and sweet or fast and fun, depending on where in New Orleans you go. Scraps N Pieces’ latest kit, On the Bayou, celebrates the best parts of this beautiful southern city: a rich history, Cajun food, jazz music, and the bayou itself. The unusual color palate calls to mind a steaming bowl of gumbo: subdued pinks and greens, a splash of blue, and a pop of bright red. The patterns and elements are a fun blend of different scrapping traditions, running the gamut from playful doodled wildlife to timeless ephemera and everything in between. 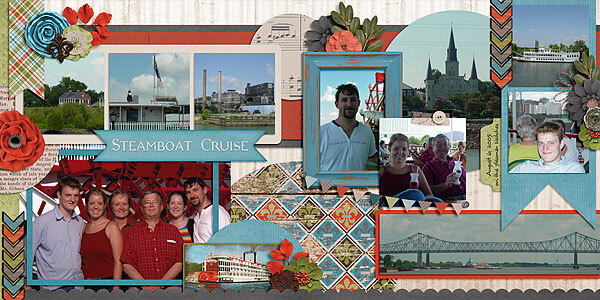 Featured motifs include the fleur de lis, musical notes, steamboats, delicious food, and life on the bayou. Thematic word strips and a corrugated alpha provide the perfect accompaniment. So whether your heart is in the French Quarter or out in the swamp, On the Bayou has something to satisfy everyone. Makes sure you grab On The Bayou during the Gingerscraps Buffet sale. Previews are linked for purchse. 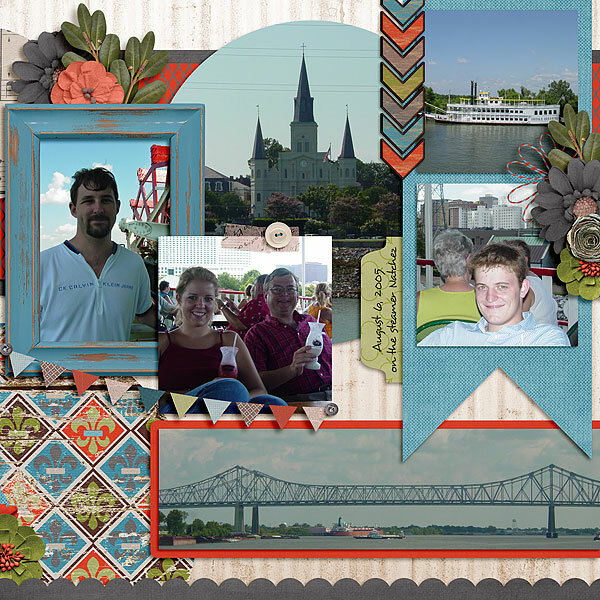 I knew I would have to scrap some cajun inspired pictures. 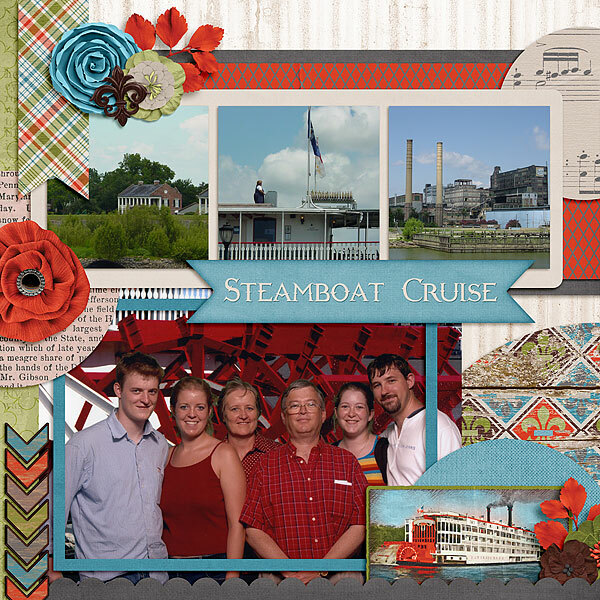 I decided on the Natchez steamboat cruise we took back in 2005 with my family when we visited New Orleans. 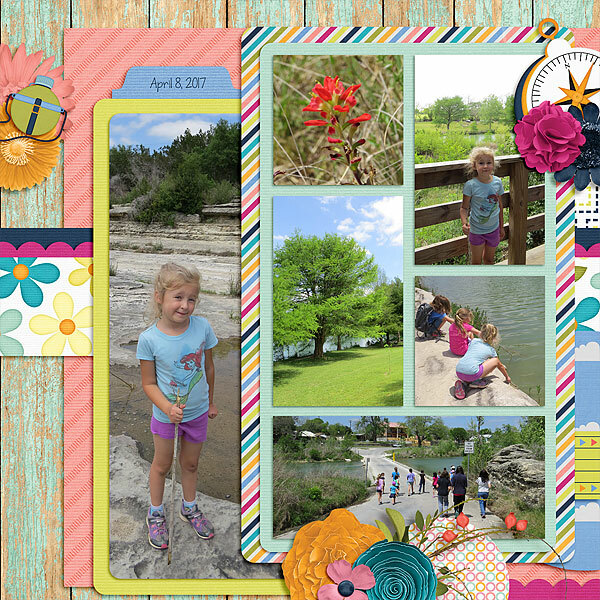 I made a two page layout and will probably need to make one more to cover the afternoon excursion. Here’s a close-up of the left and right sides. Then I decided that the template pack plus the kit would be great for a heritage layout and scrapped this neat photo of my great-great-grandparents. My friend Jan and fellow genealogist hooked me up with this picture and I cleaned it up a bit. Happy Halloween! Boo to you … and you, and you! Let’s celebrate Halloween with this “not-so-scary” collection by Magical Scraps Galore, inspired by one of the special parties held at Magic Kingdom. In bright Halloween colors, NOT SO SCARY! overflows with themed elements, including the special decorations found in the park such as banners and pumpkins, mouse-eared ghosts and bats, Mickey and Minnie’s Halloween hats, a spooky castle, the signature party fog, a bubbling cauldron, fireworks, plus the highlight of the party: the Headless Horseman!, among many other ghoulishly goodies and patterns. 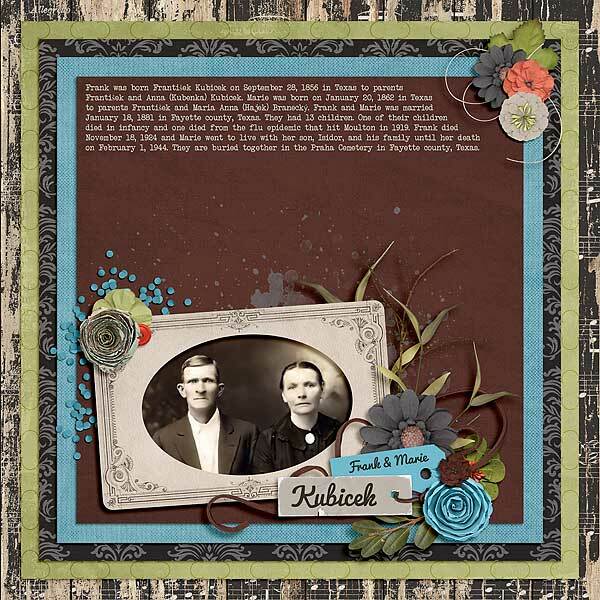 Find the full collection at 58% off -or the individual page kit and four add-ons at 30% off– through October 31st at GingerScraps and The Digichick. 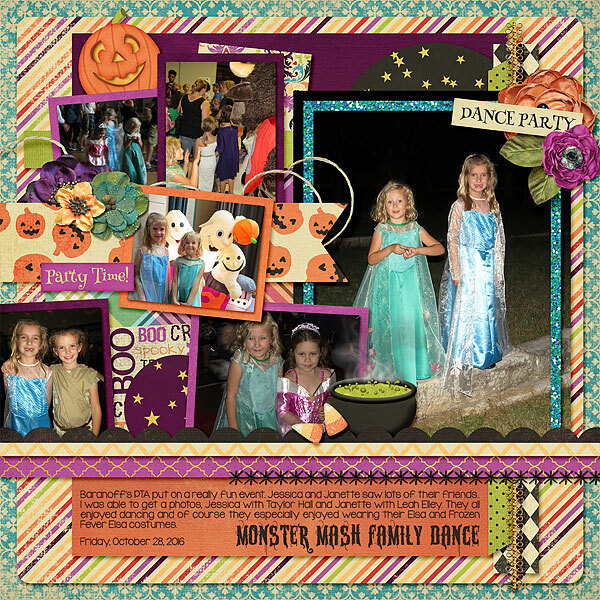 I have two layouts to share using photos from last Halloween. Digikit: Magical Scraps Galore – Not So Scary! 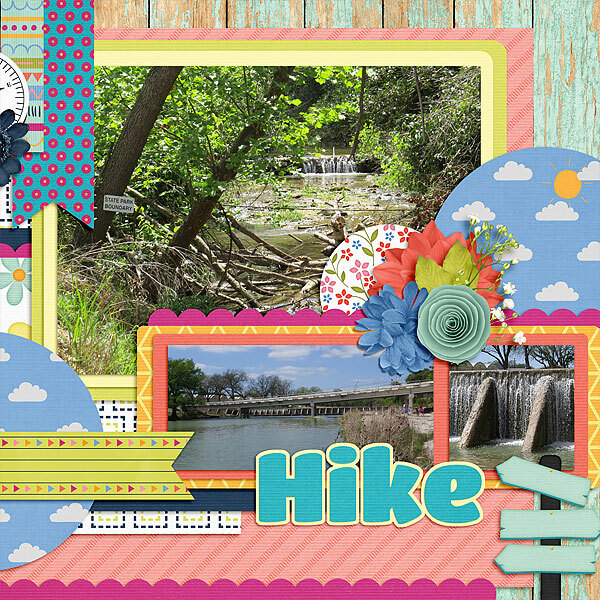 This week we have 2 beautiful clusters created by CT members Lisa and Karrie, using the Not So Scary collection. Visit Marina’s BLOG HERE to download and enjoy! Stay tuned for Marina’s new collection coming to stores soon!